Southern Arizona’s high heat and long, sunny days create the perfect atmosphere for bougainvillea to grow and bloom throughout most of the year, so we’re quite accustomed to seeing their brilliant pinks, whites, oranges, and purples in our landscapes. Since we had such a mild winter in Tucson, our bougainvilleas are really putting on a fantastic show this year. Eric gives us a quick tour of some popular Bougainvillea varieties in this week’s video blog, so I thought it might be a good time to share a few extra tidbits and tips about their flowers! It may surprise you to learn that the bright colors associated with bougainvillea aren’t actually the plant’s flowers; they are modified leaves called bracts. Bougainvillea isn’t the only plant to disguise its flowers this way, either. The colorful structures that most people think are flower petals on our holiday poinsettias are actually bracts as well. Bracts are developed only in conjunction with the flowers, but often cling to the plant long after the flowers have withered. 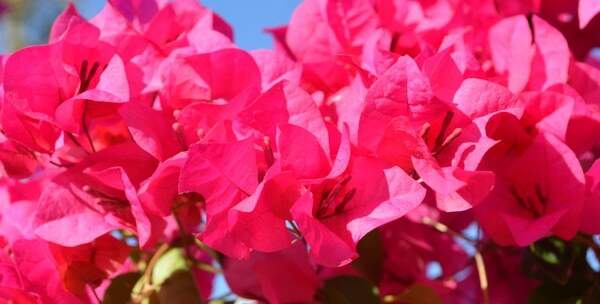 Bougainvillea’s true flowers are small, white structures that you can find within the brightly-colored bracts. They appear in groups of three, with two of the flowers opening together at the same time, and one flower opening at a different time on its own. You’ll notice, therefore, that each set of three colored bracts is often associated with either one or two tiny white flowers. The flower’s trumpet shape and long throat are designed for specific pollinators; namely butterflies, moths and hummingbirds. A long tongue (or proboscis in the case of butterflies or moths) is needed to access the nectar stored near the flower’s base, so bees and wasps aren’t typically interested in bougainvillea. Bougainvillea thrives in stressful situations, responding to extreme heat, drought, and crowded roots with more abundant flowers. 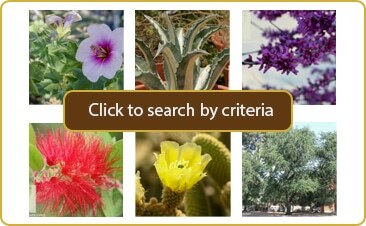 They tolerate a considerable amount of salt, and can grow quite full in a single growing season. Bougainvillea won’t grow and bloom at the same time. Instead, it alternates its energy expenditure between growing or flowering in cycles of 3-5 weeks. Feeding a bougainvillea too much nitrogen or giving it too much water will keep the plant in “growth mode” and prevent it from flowering. It does appreciate regular feeding, however, so fertilizers with lower amounts of nitrogen are often recommended for the best flower production (nitrogen is the first of the three numbers listed on the fertilizer’s label). You can also sometimes shift the plant from a growing cycle into a flowering cycle by decreasing watering frequency. So, now that you know all about bougainvillea flowers, come on by Civano Nursery to pick out your favorite colors!